The earthy and grounding carnelian comes in many colors, the most powerful ones being the red and the deep orange color carnelian. As with any crystal or stone, there are benefits to be discovered by the proper use of the rich and beautiful carnelian. In feng shui, you can often find various amulets and charms made from carnelian, because its rich earthy color and grounding energy is much needed in any home or office. Carnelian is also an excellent and affordable choice for good feng shui jewelry. Carnelian is both an energy booster and an energy stabilizer. Although it does increase the energy flow in any space (or for any body), carnelian does it in a happy and calm kind of way. It is a joyful stone that feels very secure in its essence and transmits the same warmth, protection, and inner security to its surroundings. The energy of carnelian resembles a peaceful, warm afternoon filled with genuine happiness. Its joyful energy has a nourishing and protective quality to it. Carnelian has courage, confidence, and creativity at its core; all these qualities are combined in a calm and grounded kind of way. Carnelian is found in many places around the globe; this makes this stone very affordable. Most of the carnelian on the market comes from India, Britain, Iceland, and Peru. Carnelian's main qualities are energizing and grounding/centering. Carnelian also has protective qualities and can fill one with warmth, joyful gratitude and a genuine simple happiness. It is a stone that activates one's flow of inner power/sexual energy flow and is often recommended for women. The best feng shui bagua area for the placement of carnelian is in the Love & Relationships sector of a home or office. Two carnelian hearts here can be a wonderful enhancement of warm, loving and sensual energy. The second best placement is in the Fame & Reputation bagua area. You can also place your carnelian in your feng shui money area. 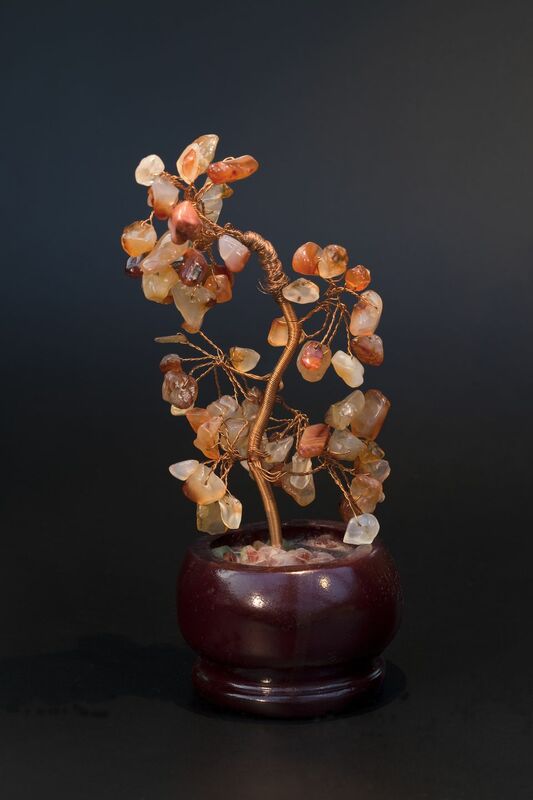 Depending on your needs, you can choose either carnelian tumbled stones, or use carnelian in various shapes such as hearts, balls, or specific feng shui carvings such as Buddha, the Dragon and Phoenix, and the Mandarin Ducks. One of the best uses of carnelian is in jewelry. One can always benefit from the warm, joyful and energizing presence of this stone in a bracelet, ring or a necklace. Carnelian can create an exquisite quality of energy when combined with most light blue color stones, especially turquoise, amazonite and blue lace agate. If neither jewelry nor feng shui amulets appeal to you, you can just carry a small carnelian tumble stone in your pocket or purse. This can work as well as jewelry does while keeping the crystal out of sight. As with any crystals and stone, do not forget to cleanse your carnelian if you wear it often.